Today is of course Mother’s Day. You know you are a mother when a good day is making it through one change of clothes without getting a child’s body fluids on you. You know you are a mother when you’re so desperate for adult conversation that you spill your guts to the telemarketer that calls and HE hangs up on YOU! You know you are a mother when you can never go to the bathroom alone without someone screaming outside the door. Today is a day to honor those women in our lives who endured these things for us. If it had not been for their love and self-sacrifice, we wouldn’t be here today. Maybe it was the woman who gave birth to you, but it also may be a grandmother, an aunt, a sister, or another dear woman who has been a mother to you. For example, there were two significant women in Timothy’s life. Acts 16:1 Paul came also to Derbe and to Lystra. A disciple was there, named Timothy, the son of a Jewish woman who was a believer, but his father was a Greek. Timothy became a close friend of the Apostle Paul and was one of his chief associates in many of his missionary journeys. Later Paul writes to Timothy. 2 Timothy 1:1-5 Paul, an apostle of Christ Jesus by the will of God, according to the promise of life that is in Christ Jesus, To Timothy, my dear son: Grace, mercy and peace from God the Father and Christ Jesus our Lord. I thank God, whom I serve, as my forefathers did, with a clear conscience, as night and day I constantly remember you in my prayers. Recalling your tears, I long to see you, so that I may be filled with joy. I have been reminded of your sincere faith, which first lived in your grandmother Lois and in your mother Eunice and, I am persuaded, now lives in you also. In the same letter, Paul exhorts Timothy, 2 Timothy 3:14-15 But as for you, continue in what you have learned and have firmly believed, knowing from whom you learned it and how from childhood you have been acquainted with the sacred writings, which are able to make you wise for salvation through faith in Christ Jesus. Timothy’s father was a Greek. However, his mother, Eunice, and his grandmother, Lois, were Jewish believers. Upon hearing the gospel of Christ from Paul and Barnabas’ preaching, they became believers in Jesus as the Messiah. Paul mentions the faith that was instilled in Timothy from an early age. Timothy exhibited the same faith in God as seen in both his grandmother and mother. They taught him the Old Testament and they were an example of faith to him. Mothers and grandmothers: how much time do you spend reading and talking to your children and grandchildren about the Scriptures? Most children, that have a godly mother, will first learn of God from her. 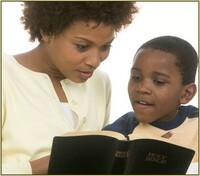 A mother should make it a priority to provide her children with the knowledge of the Scriptures and the love of God. A good Bible education will sustain their walk in the faith more so than any education they might receive from the most notable university. A mother should teach her young children songs about Jesus. Children should be singing about Jesus before they are singing about Barney. Don’t just send your children to Sunday school and let that be the extent of their learning. A mother should share in their Sunday school lesson and teach them about Jesus daily. Timothy’s mother, Eunice, had a mother of faith. Most mothers learn of God and the love of Jesus because of their mothers. If you have a mother of faith, you are truly blessed. There is nothing more powerful than a godly mother or grandmother that provides a foundation of faith, first from the Scriptures; and then from a good example. Nothing witnesses more to children than the way we act. Many grandmothers are becoming mothers again. Sin and the society in which we live have destroyed the lives of young mothers, causing them to abort, abandon, or lose custody of their children. Grandmothers are being called upon to step up once again “to train up a child in the way he should go, that when he is old, he will not depart from it,” (Proverbs 22:6). We are living in perilous times. Paul reminded Timothy of this also. 2 Timothy 3:1-7 But understand this, that in the last days there will come times of difficulty. For people will be lovers of self, lovers of money, proud, arrogant, abusive, disobedient to their parents, ungrateful, unholy, heartless, unappeasable, slanderous, without self-control, brutal, not loving good, treacherous, reckless, swollen with conceit, lovers of pleasure rather than lovers of God, having the appearance of godliness, but denying its power. Avoid such people. For among them are those who creep into households and capture weak women, burdened with sins and led astray by various passions, always learning and never able to arrive at a knowledge of the truth. Never before has Satan leveled such outrageous attacks against motherhood, as what we find today! Too many times, women are made to feel that they should apologize for being stay-at-home mothers. This happens because Satan hates mothers! His first attack was upon the mother of all living—Eve. In reality, full time motherhood is a noble calling. However, the mothers, who try to remain faithful to marriage and family in a traditional way, are not respected in this world. Nevertheless, God Almighty loves and blesses the special nature and character of every precious mother. And He endows her with a faith that is unknown in practically any other walk in life! Motherhood is one of the highest and noblest expressions of faith known to man. That is why Satan hates mothers so much. It is the loving actions of a mother towards her children that demonstrates her faith and gives her children a glimpse of God’s love. Faithful mothers have this amazing ability to rise up in the night and look after their young. They have this tremendous ability to never run out of love and patience for their children. And a faithful mother keeps evil out of her home and never loses faith that God will watch over her household! Perhaps the most important gift a mother can give to her son or daughter after birth is the knowledge of the Holy Scriptures, leading them to faith in Jesus Christ and power in the Holy Spirit. This knowledge will bear the most fruit in her child’s life. For example, during Paul's second visit to Lystra, Eunice had the great joy of seeing the apostle Paul choose her son to be his companion in the ministry. Paul referred to Timothy as his dear son in the faith. Paul speaks of Timothy’s faith and work in his letter to the Philippians 2:19-24, I hope in the Lord Jesus to send Timothy to you soon, so that I too may be cheered by news of you. For I have no one like him, who will be genuinely concerned for your welfare. For they all seek their own interests, not those of Jesus Christ. But you know Timothy’s proven worth, how as a son with a father he has served with me in the gospel. I hope therefore to send him just as soon as I see how it will go with me, and I trust in the Lord that shortly I myself will come also. Paul charges Timothy in 2 Timothy 2:15 Do your best to present yourself to God as one approved, a worker who has no need to be ashamed, rightly handling the word of truth. Paul was in prison when he wrote this letter to Timothy. Now Timothy must stand approved to God by his own growth in the Word of Truth. By God’s grace, Timothy became one of the greatest men of God who ever carried the Gospel. Paul claimed that this was possible because of Timothy’s mother and grandmother, who grounded Timothy in the Word while living in a pagan culture. Lois was a woman of great faith. She was able to pass her faith on to her daughter, Eunice, in spite of living under Greek influence and Eunice’s marriage to a Greek. If Lois’s faith had been wishy-washy or flighty of mind or heart, she could never have brought up her daughter in faith. But Lois’ faith was stable! It didn’t ebb and flow with the tide of societal influence. It stayed strong and faithful through the years! Strong enough to impart it to generations to come! Therefore, reconsider your faith, mothers. Is it strong or wishy-washy? What are you passing on to your children? Are you demonstrating your faith by the way you live and love? Mothers, take advantage of the power God gives you, and pray with all the faith you can muster. Live your life openly as a woman committed to following God. These things will greatly influence your children. Therefore, consider your priorities. It is easy to let the most important relationships take a back seat to less important things. Your top three priorities should be God, husband, and children in that order. When you have these priorities in their proper place, and trust God, all will be blessed. But when your priorities are out of order, you communicate to your husband and children that they are less important. This is what they will remember. Not only that, but if your children are not a priority, they will get drowned in a sea of iniquity in this wicked world. The world will raise your children and pass its beliefs on to them—not your faith. Faith begins with accepting Jesus Christ as your personal Savior and Lord, acknowledging Him publicly, being baptized and filled with the Holy Spirit. Your children are watching everything you do, even when they seem to ignore you. What you do speaks louder than what you say. Show your children what faith, love for God, respect for their father, and a godly woman looks like. Prov 31:26-31 She opens her mouth with wisdom, and the teaching of kindness is on her tongue. She looks well to the ways of her household and does not eat the bread of idleness. Her children rise up and call her blessed; her husband also, and he praises her: “Many women have done excellently, but you surpass them all.” Charm is deceitful, and beauty is vain, but a woman who fears the LORD is to be praised. Give her of the fruit of her hands, and let her works praise her in the gates. Husbands and children, what can we do for our wives and mothers? Most importantly, we can pray for them. Just because God blesses mothers doesn’t mean Satan doesn’t attack. On the contrary, they are under constant attack, and sometimes a mother’s difficulties are great. Pray for her, that God will protect her and measurably increase His grace toward her. Many of us are adults and some of our mothers and grandmothers have passed on. How can we honor them? You can honor their faith and their lives by walking with the Lord. There is no better way to esteem and reverence their memory; thanking God for all that they instilled in your life. Perhaps you are a mother who has failed to show your children a godly life because you have lacked faith in Jesus Christ. Perhaps you never had a godly mother to instill faith in you. There is great hope for you in the Gospel of Jesus Christ. You see, even though Lois and Eunice were godly women, if they had not come to believe in Jesus Christ as their Savior, they would have gone to Hell and led Timothy there, too. Everyone needs faith in Jesus to receive salvation, eternal life, holiness, and Heaven. You can change your life and your influence on your children today—even if they are adults. The best way to begin is to give your life to Jesus Christ. You do that by simply believing that Jesus is the Son of God who atoned for your sin on the cross. Then make a public confession of your faith and die to your old life by following Jesus in water baptism. The Holy Spirit will give you a new life and grace to walk with the Lord every moment of the rest of your life. Your children will be greatly affected by the new person you become in Jesus Christ.